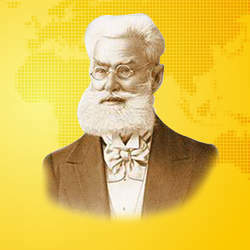 The dedicated naturopath Friedrich Eduard Bilz and the visionary industrialist and beverage expert Franz Hartmann from Detmold develop a natural refreshment drink based on tropical and local fruits. 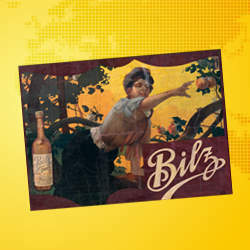 “Bilz-Brause” (Bilz-Lemonade) is the first non-alcoholic international beverage brand of European origin and soon proves to be a tremendous success. In 1902, a total of 3 million litres are sold; in 1903, this figure has already risen to 7 million. By 1903 some 30,000 catering and retail businesses in Germany have already included the fruity drink in their range of offerings. Sales of Bilz-Brause soar further to an annual sales volume of 25 million litres. 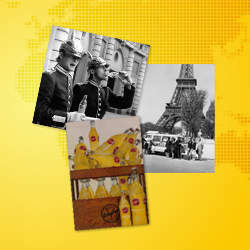 In the summer of 1904, a sensational 60,136 bottles daily are sold in Berlin alone. After a dramatic increase in production and distribution, and on account of the numerous copycat products already appearing, an open competition is initiated with the aim of finding a catchier and protectable brand name for the lemonade. 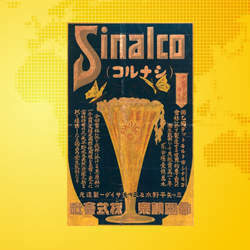 The initiative is successful: Inspired by the Latin “sine alcohole” – in English: “without alcohol”, the name Sinalco is created. It sets the course for an unparalleled success story. 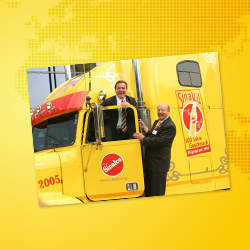 Today, the brand name is protected by world-wide trademark rights. 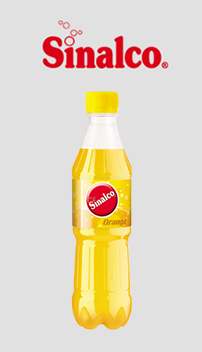 Sinalco establishes itself as a global brand: The lemonade made in Germany is among the first beverages to be exported to countries around the globe, with a focus on South America and the Middle East. 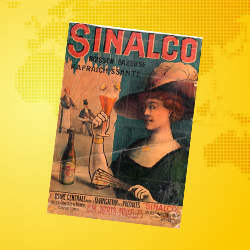 In the same year the Sinalco AG is set up. 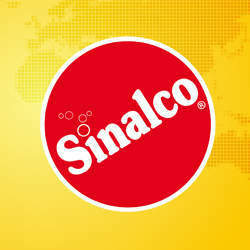 Meanwhile Sinalco has 67 general agencies, int. al. in China, Egypt, Argentina, Brazil, Chile, Spain, Turkey and Russia. 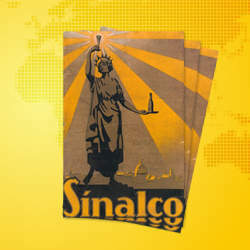 Sinalco in the U.S. promotes in Art Deco Style. During the First World War production and export are ceased. 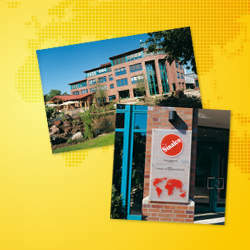 Buenos Aires (Argentina), Lima (Peru), San Salvador (El Salvador), Valparaiso (Chile), Chicago (USA), London (Great Britain), Stockholm (Sweden), Athens (Greece), Nicosia (Cyprus), Constantinople (Turkey), Tel-Aviv (Israel), Warsaw (Poland), Windhoek (Namibia). Another milestone in the brand’s history is reached: The distinctive Sinalco logo, known as the “Red Point”, i.e. 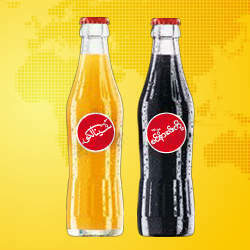 the characteristic red circle with diagonal lettering, becomes the world-wide identification mark for the German brand. During the Second World War and in the post-war period production and export are ceased again due to missing raw materials and interrupted business relations. 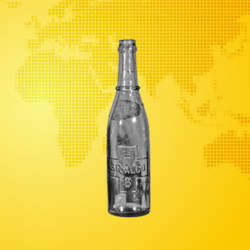 In the Fifties a unique packaging is born with the legendary Sinalco bottle shape, which starts a worldwide triumphal procession. After the war Sinalco already achieves in business year 1950/51 the greatest turnover since company foundation. 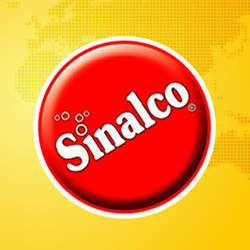 Sinalco is relaunched in Africa, Middle East and South America. 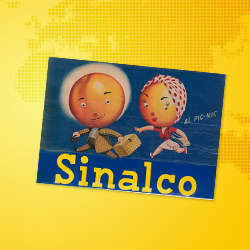 In year 1954 Sinalco builds its first foreign factory, in Basra, Iraq. 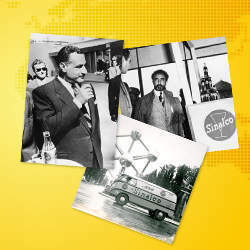 In 1955 the last emperor of Ethopia, Haile Selassi, visits the Sinalco stand at the trade fair in Addis Abeba. In 1956 the president of Egypt, Gamal Abdel Nasser, opens the Sinalco stand at the trade fair in Cairo. 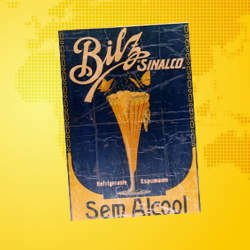 In the Sixties, Sinalco is extremely successful at a national and international level – the drinks of this brand are available in 150 countries. 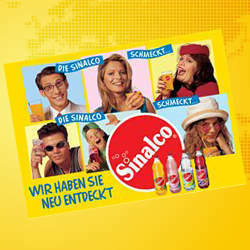 In German, the brand name “Sinalco” is to some extent even used as a synonym for lemonade. After the death of the original owner family, Sinalco is acquired by Dortmunder Actien-Brauerei. 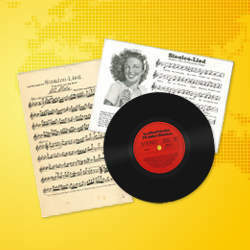 The legendary jingle „Sinalco schmeckt“, which has its origin in the Flea Waltz, will be used the first time. 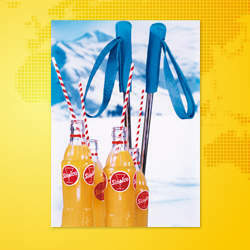 Sale of the trademark rights to Switzerland. The brand logo will be made over and matched to the spirit of the time, but the red point as brand mark will of course remain the same. 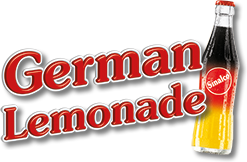 Family Hövelmann, which is resident in Duisburg, purchases the trademark rights for the lemonade classic Sinalco for Germany, Austria, and Luxembourg. The establishment of “Deutsche Sinalco GmbH Markengetränke & Co. KG” paves the way for the relaunch and revival of the traditional Sinalco brand. The Hövelmann family goes on to purchase the international trademark rights – the international brand “Made in Germany” has returned to its country of origin! On 1st October, 1997 the newly founded “Sinalco International GmbH & Co. KG” based in Duisburg-Walsum takes up operations. 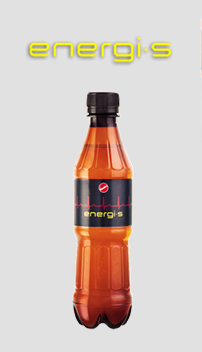 The cult brand gives its bottle shape a new look. 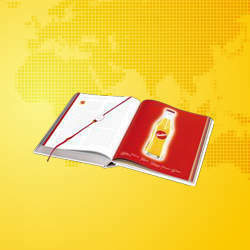 The bottle gets a face lift, suitable to the new millennium, and will be launched now worldwide in this updated shape. 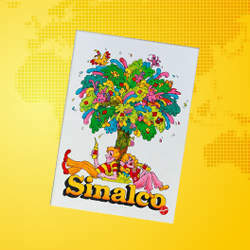 Worldwide Sinalco advertises with the yellow background colour and the red lettering. 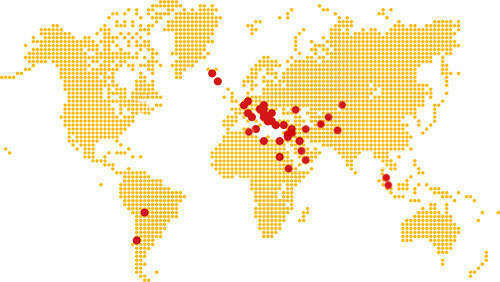 Sinalco is represented everywhere in the Balkans. 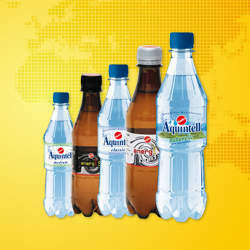 Aquintéll and energi s are internationally launched as line extension. 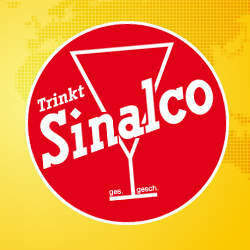 Sinalco celebrates its hundredth birthday on the drinctec fair in Munich with many international guests. In Duisburg the centenary will be opened with a commemorative speech by the acting Federal Chancellor Gerhard Schröder, who so appreciates the outstanding position of the lemonade classic at the market. 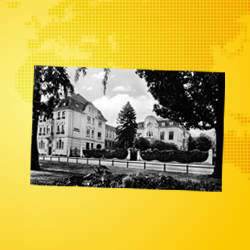 Sinalco features as an icon of German consumer history on the cover of the book “Deutsche Standards – Marken des Jahrhunderts” [German Standards – Brands of the Century]. 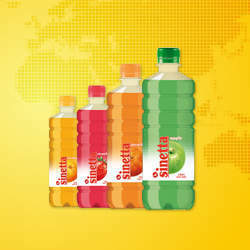 Sinetta as an independent product line with a fruit content and 100% taste is launched in Macedonia, Jordan and Iraq. The new 3-D-logo is launched. 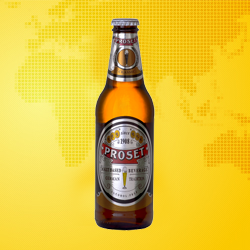 Enjoy “German Gemütlichkeit” with the international launch of the historical brand Proset, which is an alcohol-free malt beverage, that shares the same attributes as beer – except for alcohol. Proset- German Tradition. 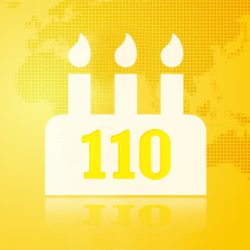 The oldest softdrink brand of the european mainland, Sinalco, celebrates its 110th birthday with lots of international activities – stay tuned to experience them!